An adult male received multiple traumatic injuries when he and a female were thrown from a horse on Red Oak Road near Rebel Lane Saturday afternoon 30-October at approximately 1558. The female was reported to be unconscious. Medic 9 and Engine 9 arrived a few minutes later to find the man in a ditch with a fractured femur among other complaints. Click here for additional information. Stations 1, 12, 18, 19, 24, 26 and 27 responded to a residential structure fire at 503 Fifth Street, Friday morning 29-October at 1043. 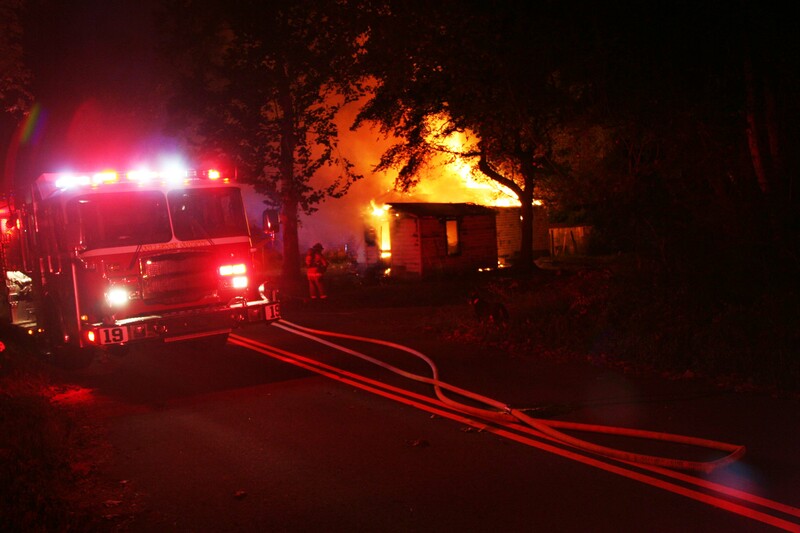 Engine 26 arrived to find the doublewide mobile home approximately 30 percent involved, with flames through the roof. 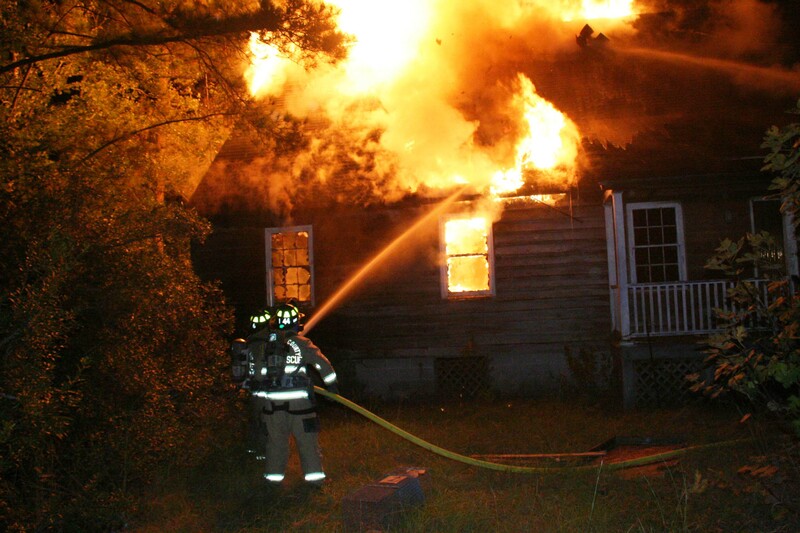 Firefighters made an aggressive interior attack with one 1-3/4 handline and quickly brought the fire under control. Click here for additional information. An early morning altercation has left one man in critical condition and sent a second man for treatment at Colleton Medical Center. Both men received stab wounds to the chest during an altercation at 319 Francis Street, Friday morning 29-October at 00:18. Walterboro Public Safety Officers secured the scene where both men were found. The home was in disarray with a large quantity of blood in one room. Click here for additional information. Congratulations to Tasha and Travis Dewitt (and Tanner) on the birth of their daughter Tatum Ashland, born at 0955, 27-October at Colleton Medical Center. Tatum weighed 6 lbs. 7 oz. and 18-1/2 inches long. Tasha is the Administrative Assistant in the Fleet Management Department at Headquarters. Southbound I-95 at the 53 mile marker became a parking lot Sunday evening 24-October following a five vehicle collision that blocked both lanes. At approximately 2103, a covered utility trailer being pulled by an older model full size Chevrolet Blazer, broke away from the Blazer. According to the driver, they were moving from Virginia to Florida. Click here for more information. Fire Marshal Richard Sheffield was recently featured in the MUSC Children's Hospial Burned Children's Fund newsletter. Click here to view the newsletter. A two car collision on Jefferies Highway has left one man dead and three others injured. 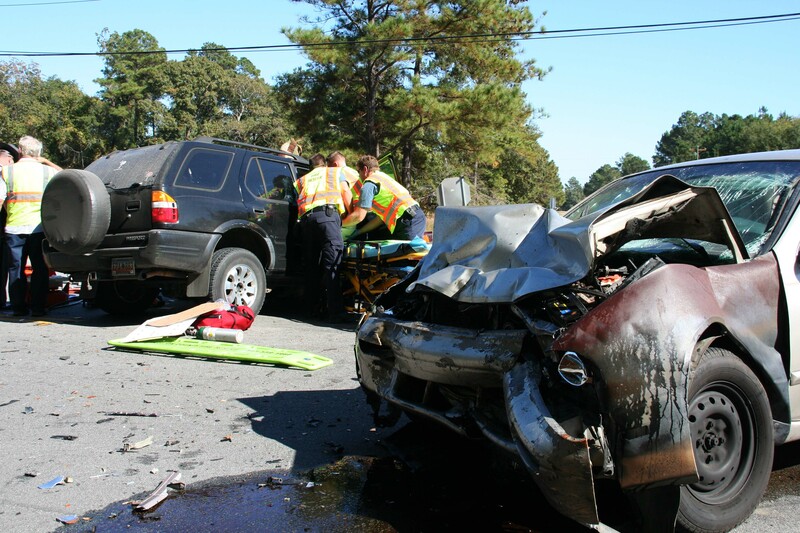 Stations 1, 19 and 26 responded to the high speed MVC at the intersection of Jefferies Highway (US Hwy 15) and Industrial Road, north of Walterboro Friday afternoon 22-October at 1425. The cars appeared to have collided head-on, after one vehicle pulled from the side street into the path of a northbound car. Click here for more information. Congratulations to Firefighter Joseph Ferneza and Firefighter/Trainee Kerri Fulmer on the birth of their daughter Kaylynn Carol, born this morning at 11:44 weighing 6 lbs. 7 oz. and 19 inches long. Station 1 responded to a high speed single car MVC in approximately the 800 block of Ivanhoe Road at 21:46 Monday evening 18-October. The south bound Toyota left the roadway in a curve near the nature trail, went down an embankment, then struck a tree. The small car received heavy damage. 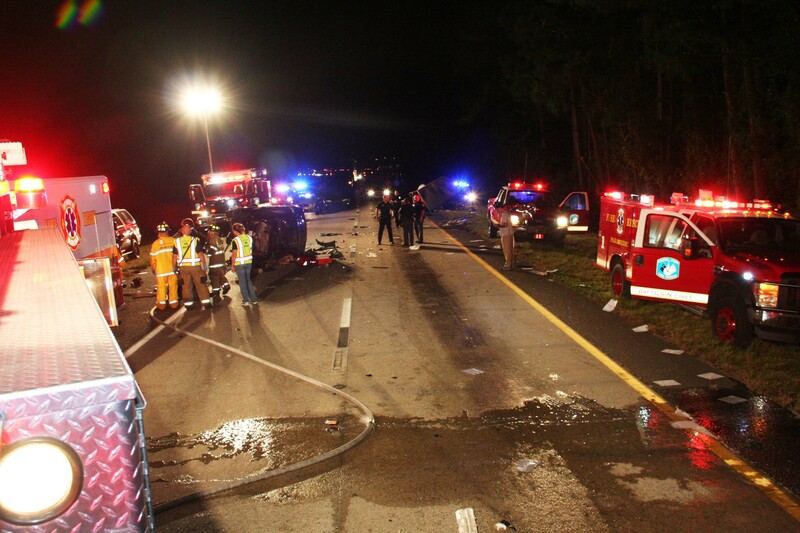 Both occupants were wearing seatbelts, but suffered multiple traumatic injuries. Click here for additional information. Stations 5, 19, 24, 26 and 27 responded to a two alarm structure fire at 1232 Burlington Road Wednesday evening 13-October at 2321. 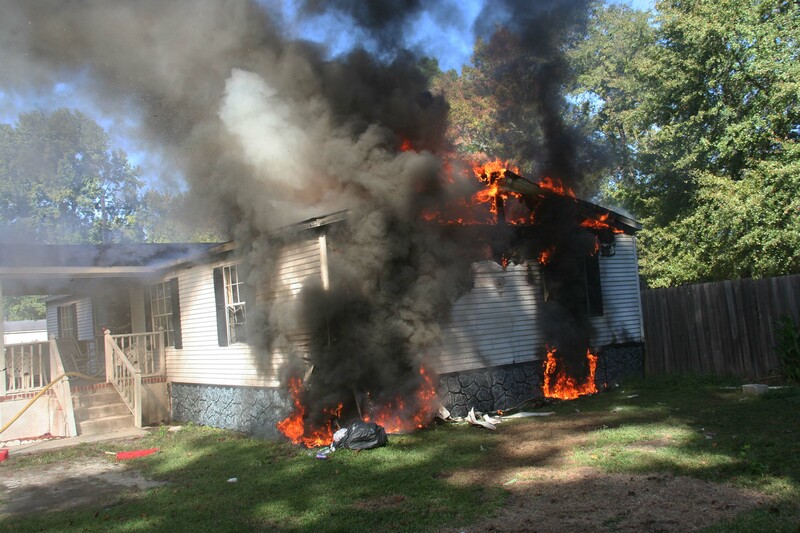 A motorist driving past the residence reported fire coming from the structure. Engine 19 arrived within minutes to find heavy smoke and fire conditions coming from the two story wood frame dwelling. Click here for additional information. Stations 2, 6, 21, 22, and 28 responded to a structure fire at 15529 Bennetts Point Road Wednesday afternoon, 13-October at 1345. The caller to 9-1-1 reported the building as being fully involved. The structure was located behind a thick patch of bamboo, which obstructed it’s view from the road. The fire had been burning a long time before it was discovered. Click here for additional information. Stations 7 and 18 responded to the end of Strawberry Farm Road in the Johnsville Community Sunday evening 10-October at 20:18. A hunter fell from a deer stand receiving a suspected spinal injury. The man was unable to move his legs and remained in the woods for several hours until someone checked on him and alerted emergency units. He was packaged at the scene and transported by Medic 18 to a nearby field off of Strawberry Farm Road. Click here for additional information. 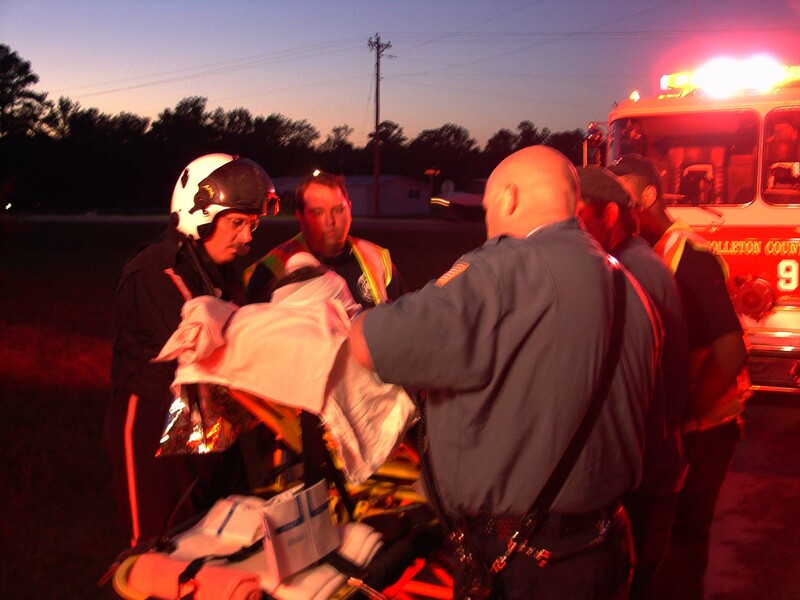 Stations 9 and 11 responded to an ATV accident on Cardinal Lane Sunday evening 10-October at 18:49. 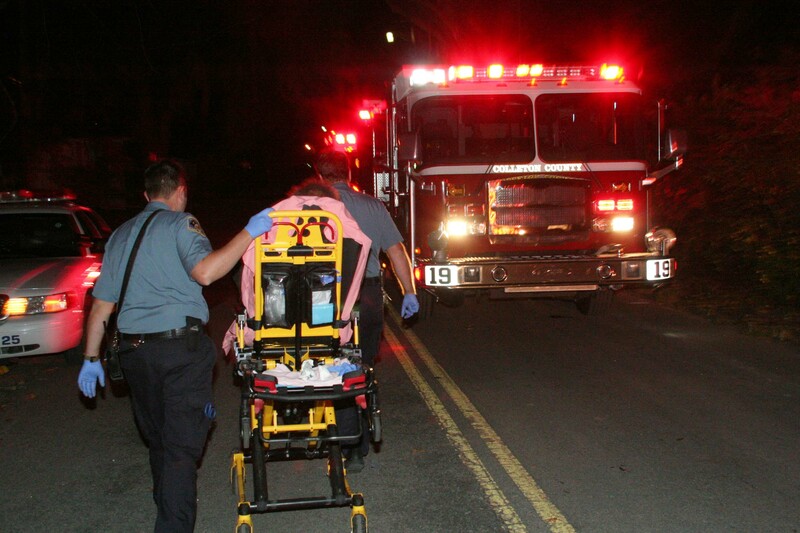 Medic 9 treated a teenage girl with an impaled stick in her eye. The injury was received while riding an ATV in the woods. 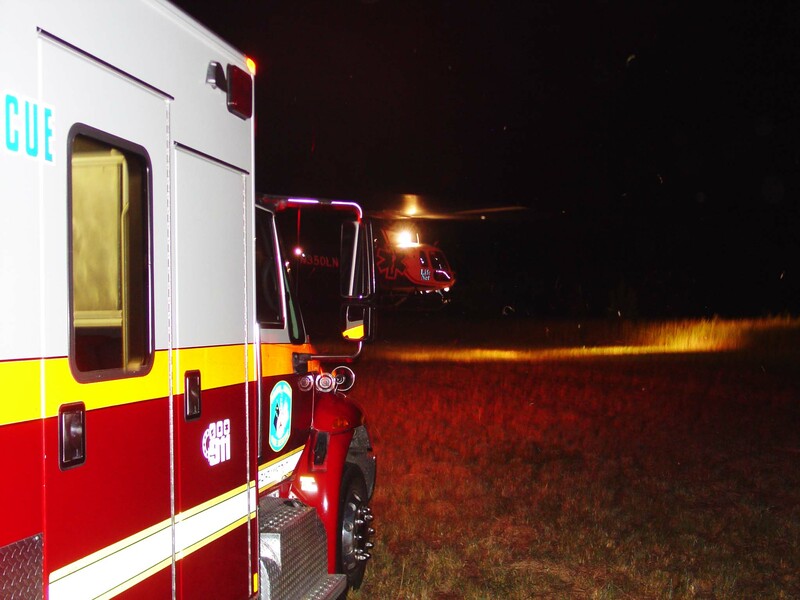 Firefighter-Paramedics treated the girl at the scene, then transported her to a nearby field to meet with the Omniflight-Charleston Medical Helicopter. Click here for additional information. 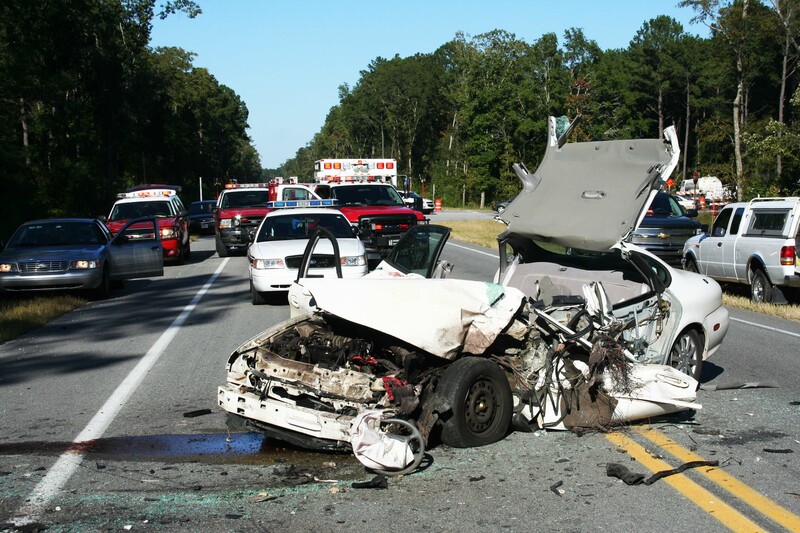 Stations 6 and 19 responded as mutual aid to Beaufort County for a car vs tour bus MVC on US Highway 17 Thursday afternoon 7-October at 1551. The accident was reported to Colleton 9-1-1 Operators as being in Colleton County near the Green Pond Community. Multiple units were enroute to the area, when the correct location was identified as US Highway 17... click here for additional information. Stations 9, 11 and 19 responded to a MVC with HazMat in the 26000 block of Augusta Highway (SC Hwy. 61) near the Dorchester County line Thursday morning 7-Ocotober at 07:36. Engine 11 arrived to report a fully loaded tractor trailer with a MC306 trailer on its side in the ditch. 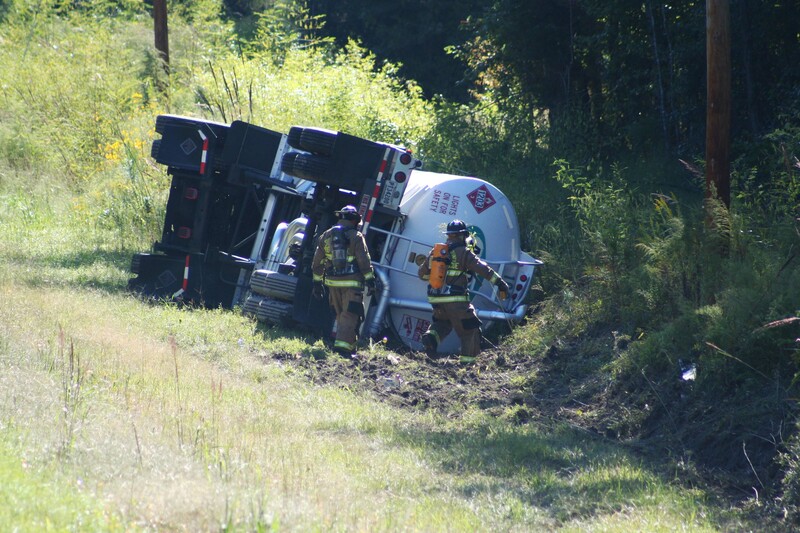 The vehicle was off of the roadway and was leaking product at a small rate from two compartments. Click here for additional information. Fire-Rescue kicked off it’s month long Fire Prevention Activities in the Elementary Schools Monday 4-October at Northside Elementary School on Industrial Road. 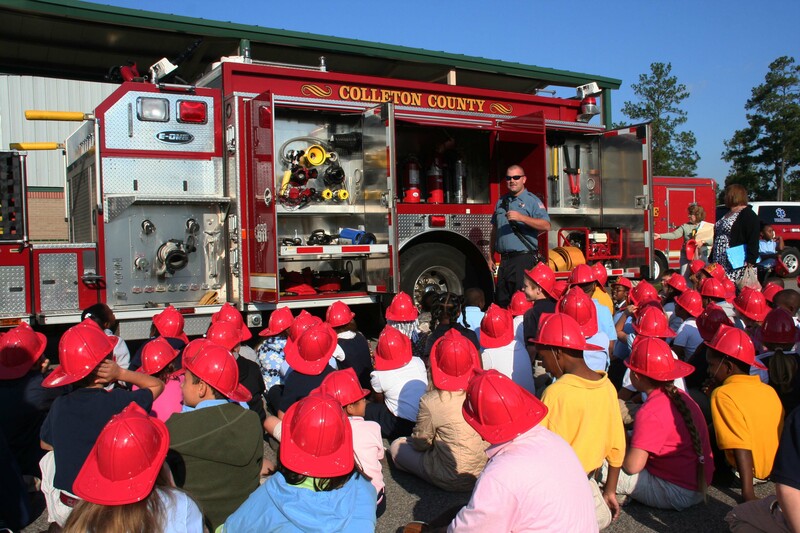 The actual program runs year-round with activities and presentations throughout the year, but a concerted effort to reach the younger school aged children coincides with National Fire Prevention Week in October. Click here for additional information. 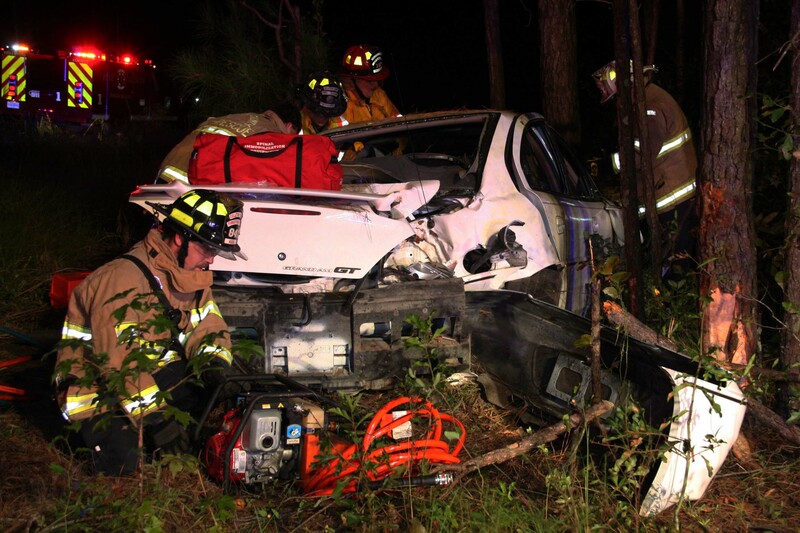 Stations 1 and 19 responded to a high speed, single car MVC on Charleston Highway at the intersection of Brittlebank Road Monday morning 4-October at 00:34. The westbound small car lost control and crossed both lanes of traffic striking several trees. Two occupants were in the inside the car complaining of multiple traumatic injuries. Click here for additional information. 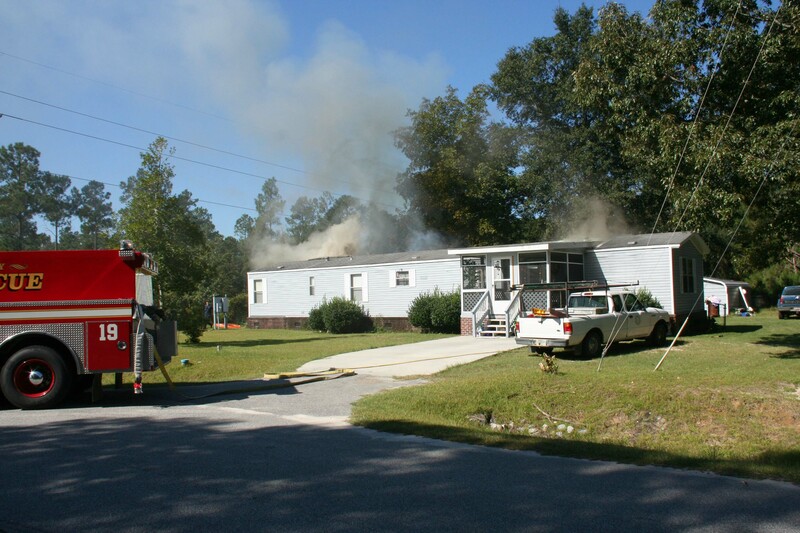 Stations 1, 9, 19 and 26 responded to a structure fire at 101 Dublin Drive at 1054, Sunday morning 3-October. Engine 19 arrived to find heavy smoke conditions in the singlewide mobile home with heavy fire conditions in the enclosed porch on the rear of the building. Engine 19 deployed two 1-3/4 handlines. Two vehicles were parked in the yard. Click here for additional information. Stations 1, 19, 26 and 27 responded to a structure fire at 79 Cross Court Sunday morning 3-October at 0056. Engine 19 arrived to find the older single family wood frame dwelling approximately 85 percent involved. Flames were extending well above the trees and could be seen from a mile away. 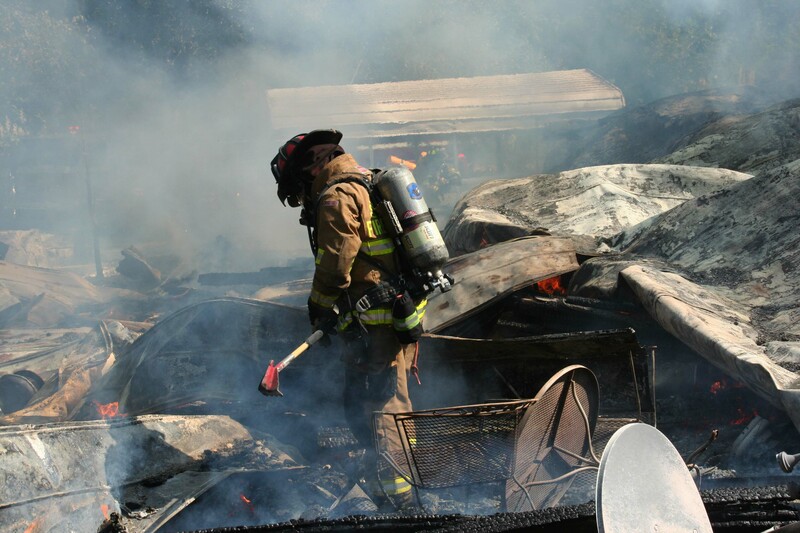 Firefighter-Paramedics deployed two 1-3/4 handlines to combat the fire. Click here for additional information. Stations 1 and 8 responded to a fall with injuries at 342 Flint River Ct Saturday afternoon 2-October at 1348. 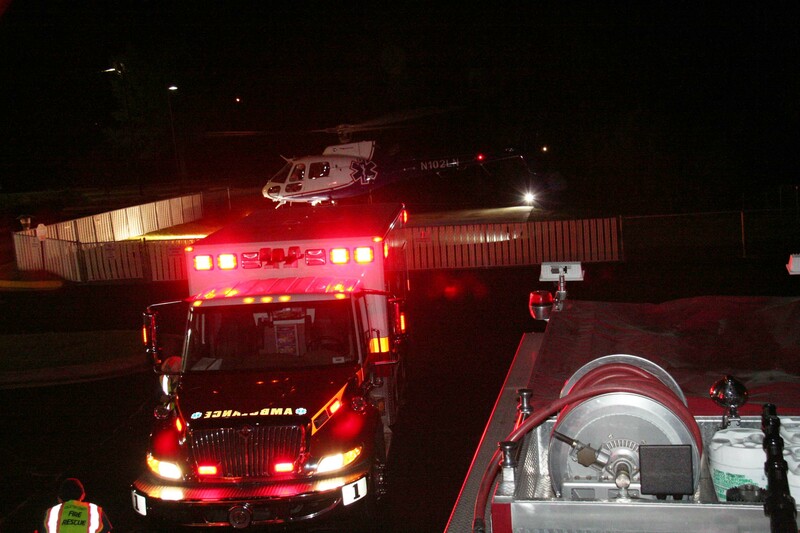 The adult male patient suffered a suspected head injury in the fall. 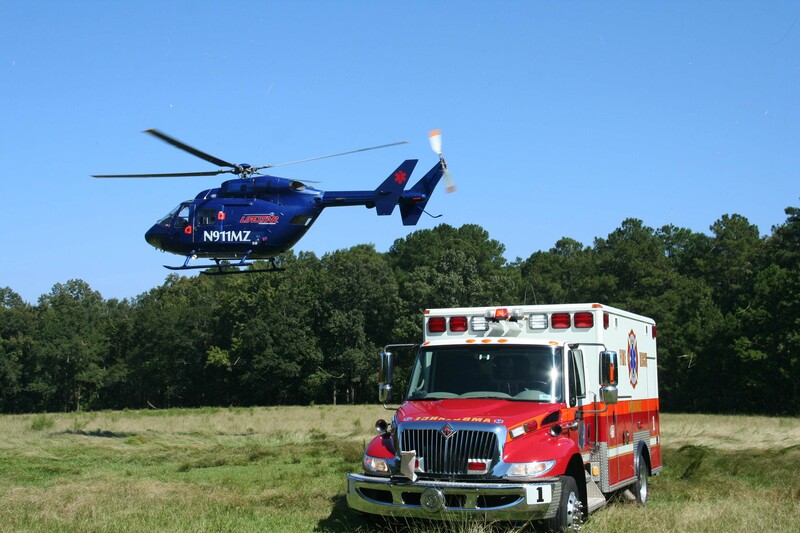 Med Control at Colleton Medical Center advised Medic 1 to fly the patient to a Trauma Center. 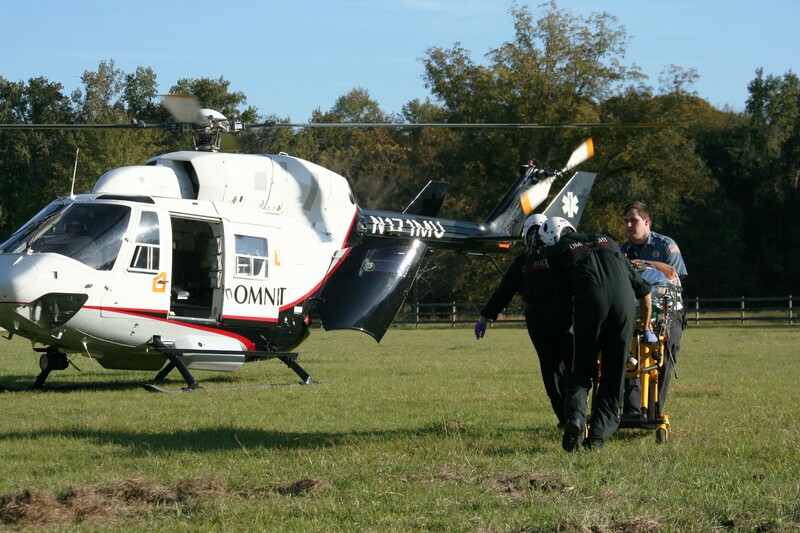 Omniflight-Savannah (Lifestar) was dispatched to a large field approximately two miles from the scene. Click here for additional information. 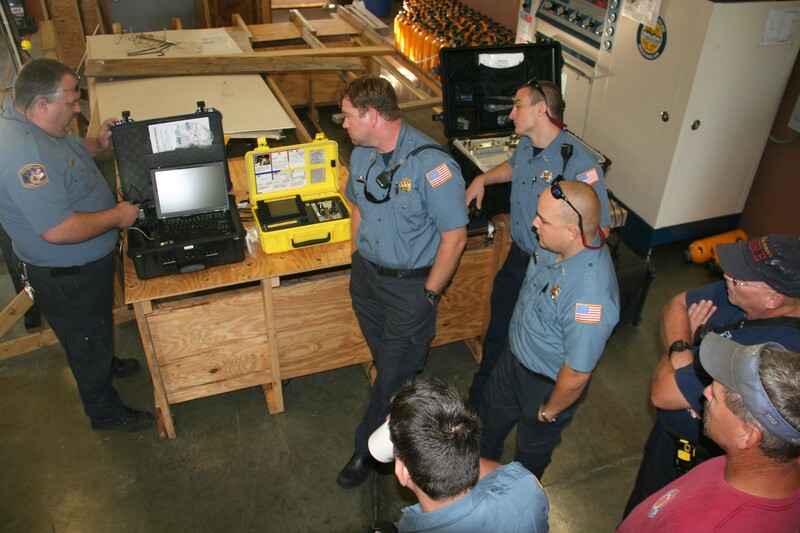 Members of the Tactical Response Team gathered at Station 19 on Saturday morning, October 2, 2010 to train on hazardous materials response. Personnel reviewed the myriad of air monitors used for detecting toxic industrial chemicals and weapons of mass destruction. Personnel then trained on mass decontamination. Click here for additional information. 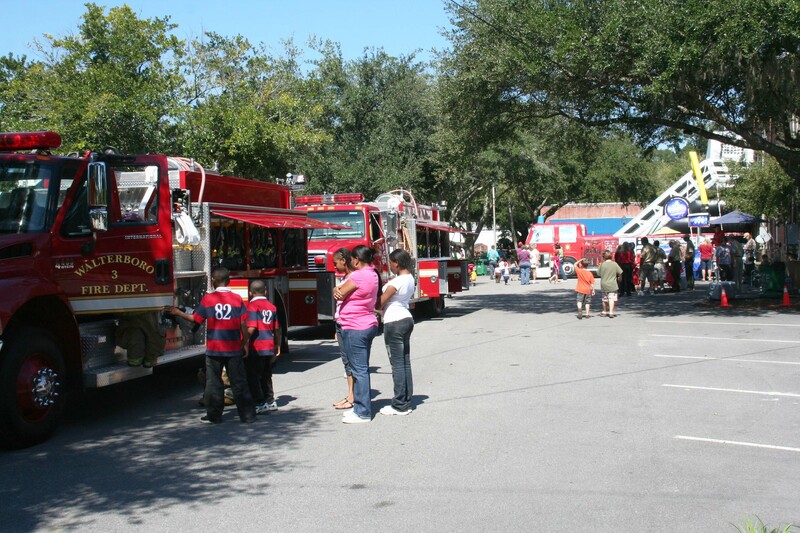 The City of Walterboro Fire Department celebrated 140 years of service Saturday 2-October, which kicked off Fire Prevention Week. The department started around 1880, which is the earliest documentation in City Hall minutes. That was about the time the department began operating from City Hall. Click here for additional information.